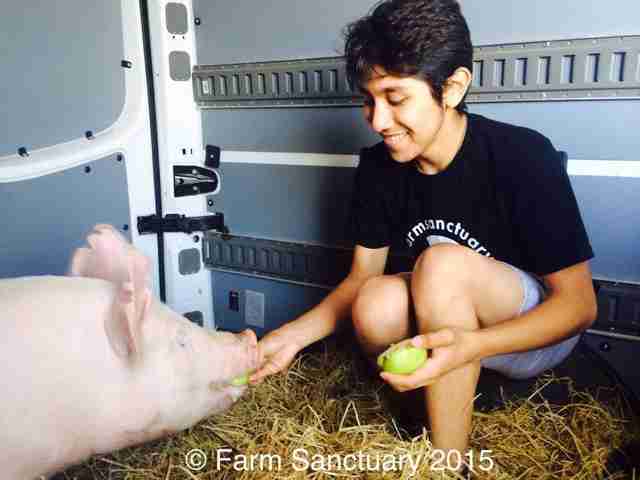 Bruno first met Lola when he purchased her through the Future Farmers of America (FFA) program at Fullerton Union High School in Fullerton, California. 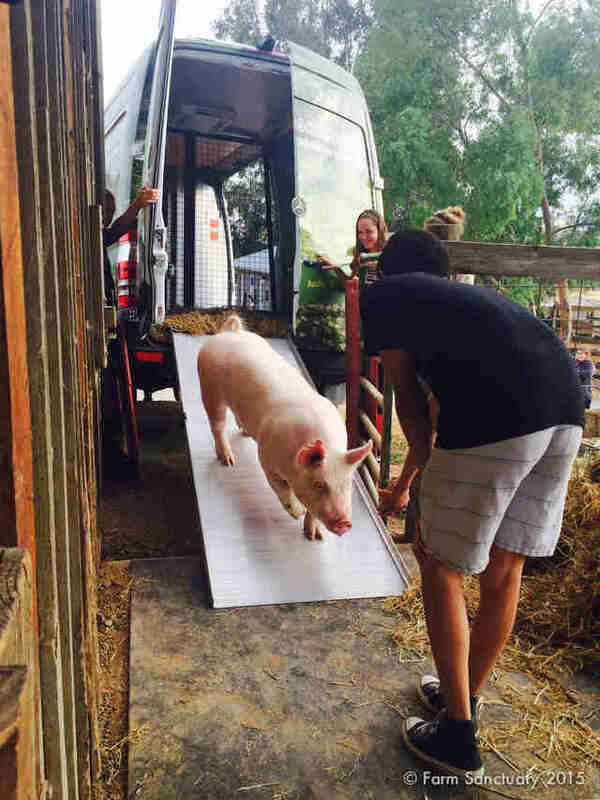 The school's FFA program has a farm lot attached to the school, and students are encouraged to purchase animals who are then homed on the FFA campus. As in 4-H programs, FFA students are responsible for all aspects of animal care, from feeding and cleaning to learning to walk with their animals, as if before a judging panel. They then take them to the Orange County Fair - before sending their hand-raised animals off to slaughter. But for Bruno and Lola, it was love at first sight. The young pig quickly took to the boy, and would eagerly grunt when he came to visit her each day. "She was like my best friend," Bruno said. And as their friendship progressed, Bruno's feelings quickly began to change. "She's just made a huge impact on me by making me realize that they're just like us," Bruno said of Lola. "They have the same feelings as anyone else and they don't deserve to get slaughtered." "There was this one time where I was just feeling really sad about all the rest of the animals and I started crying, and she noticed I was crying," Bruno said. "She was inside this little play area. I was sitting down on the ground. She came toward me. I started petting her and she just flopped on the ground so I could pet her belly." Most children in the FFA program choose to hire a butcher to kill their pigs, and the butcher will come right to campus to do it. The pigs are killed on the FFA lot right next to the high school - and in clear view of any students who happen to be passing nearby. "They slaughter the animals on the farm that we raise the animals at. I witnessed it and it was heartbreaking for me," Bruno said. "I couldn't handle it." He was also unnerved by what he perceived to be the indifference of the other students. "I think it's pretty sad because they don't care - they really don't care about it," Bruno explained. "I was just there, horrified of the experience." Alicia Pell, national placement coordinator for Farm Sanctuary, told The Dodo that it's not uncommon for the group to receive calls from sad students second-guessing their FFA or 4-H projects. But many children don't realize that saving the animal will mean a change on their end, too. 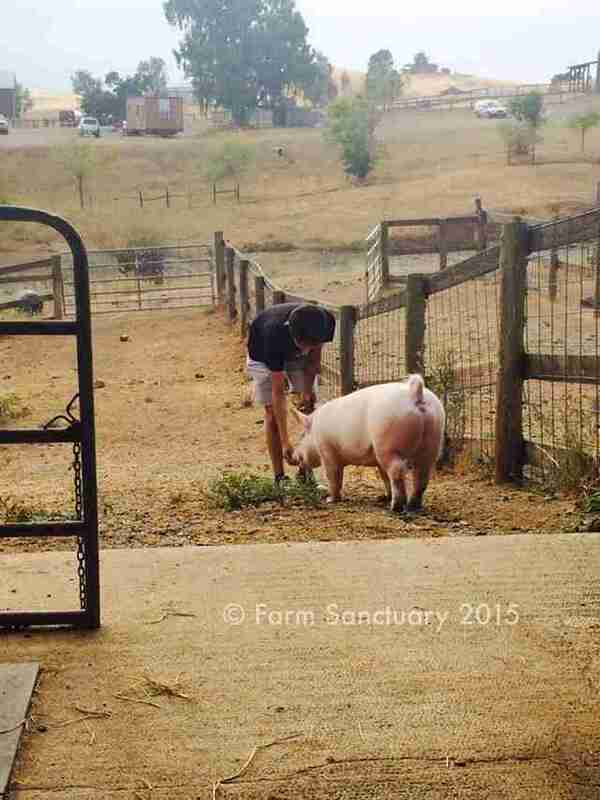 "Sometimes they don't make the connection that they need to not purchase pigs in FFA anymore," she said. "They think, 'Oh, I'll just raise another animal in FFA next year and find a sanctuary again' ... That just perpetuates the cycle." 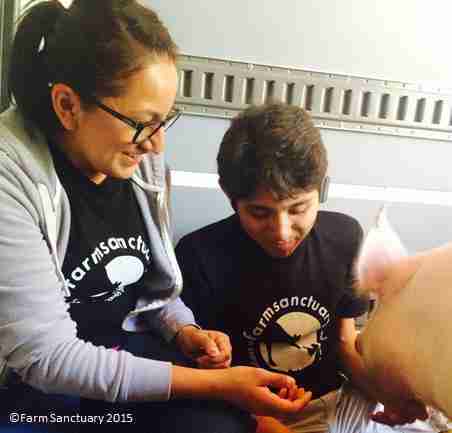 But Bruno was different, she said, and Farm Sanctuary jumped in to help. 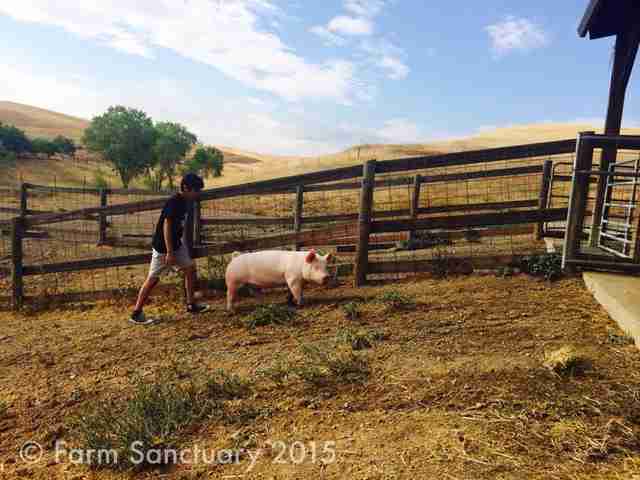 Last week, Bruno and his mother joined Lola and the Farm Sanctuary volunteers on the pig's six-hour journey to her new home at the rescue's Orland, California, location. 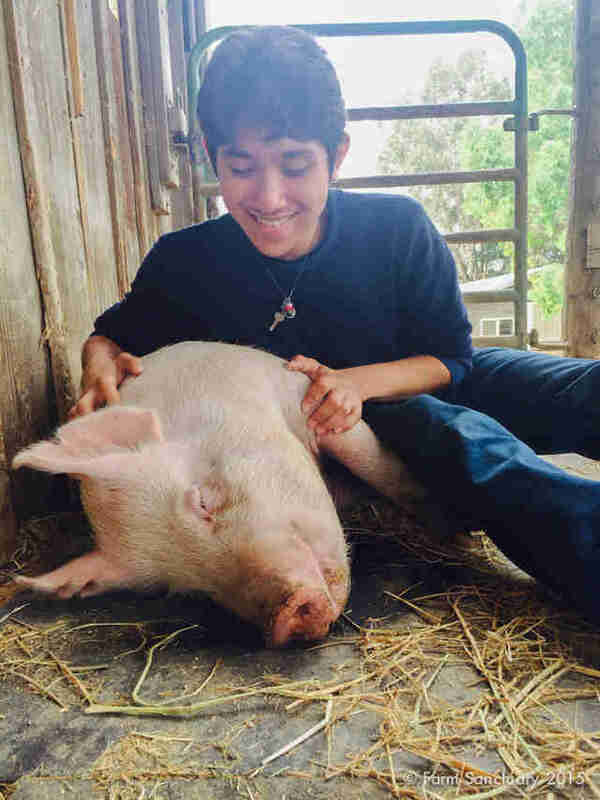 Bruno said the entire experience has wrought a significant change in him, and that he's reevaluated his beliefs about both animals and the FFA program as a whole. "It changed my perception by just showing that FFA tends to ... desensitize the students that go in there," he said. "Students in the FFA are getting changed by [the program] showing them, 'These are just things that you should kill and eat, not things you should bond with.'" And he realizes he's lucky that he could help Lola escape. While students in FFA programs pay for their animals and technically own them, he said, he's heard rumors from other students that their schools will discourage students from backing out of the butchering. "They do bond with them," he said of other students. "They do cry when they have to give them up; they don't have any place to take them elsewhere." 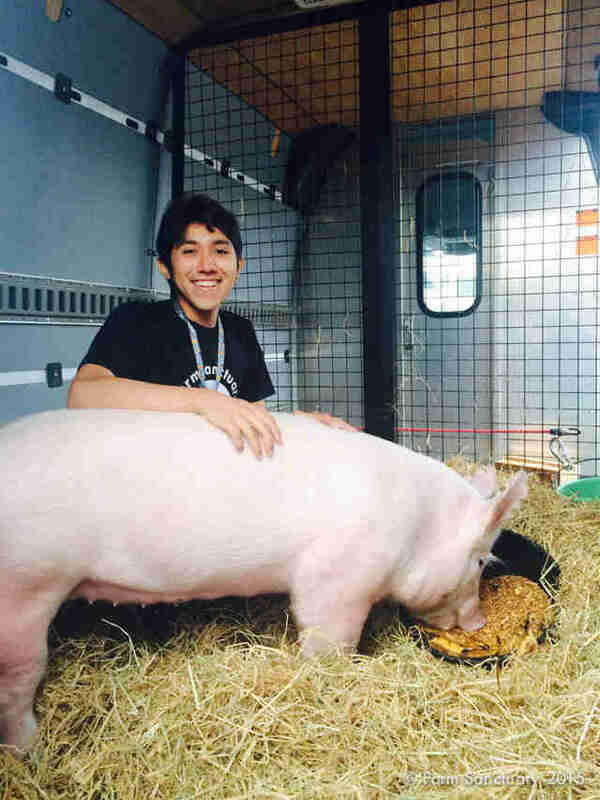 Most importantly, he said, he's realized that animals are just like us, and he and his mother have decided to go vegan as a result. "She's just like any type of animal or person," he said of Lola. Pell echoed Bruno, noting that what makes FFA, and other programs like it, so tragic is that it teaches children to become desensitized. "They're coming to understand them [the animals] as they understand their dogs and cats - that they're thinking, feeling beings - and then they're sending them off to slaughter," she explained. And the damage is even more hurtful to the animals, who are on the receiving end of what Pell described as "the ultimate betrayal." "The animals come to know their caretakers very well," she said, adding that they form very strong bonds with the children, who are often the only source of love and companionship they'll ever know. "They trust them, because they're their friend ... They follow them willingly into the fair, willingly into the stadium where they're being auctioned off. 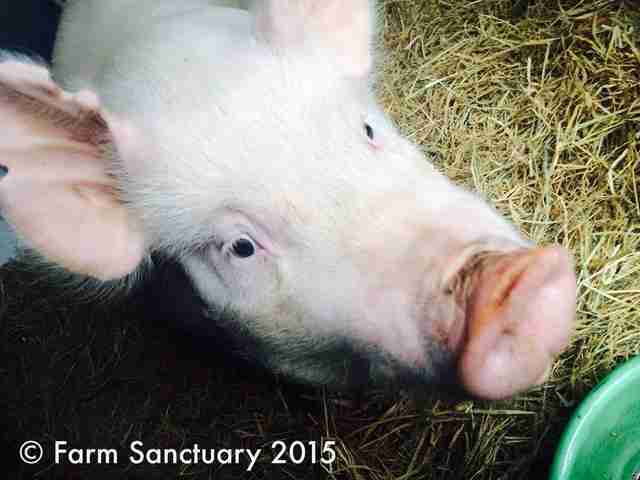 "They don't know that their best friend is watching them being sent off to slaughter," she added. But fortunately, Lola's future is a much brighter one. 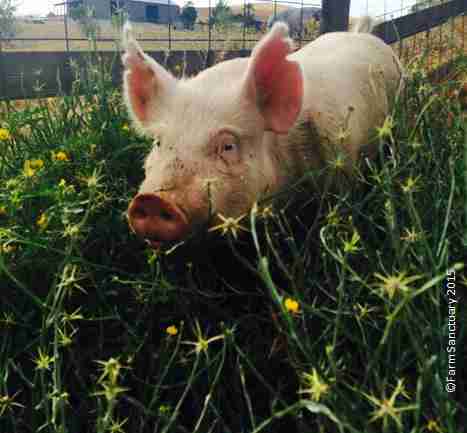 Pell said she's doing great at her new home, which has lots of grass and mud and - once she's out of quarantine - other pigs to play with. 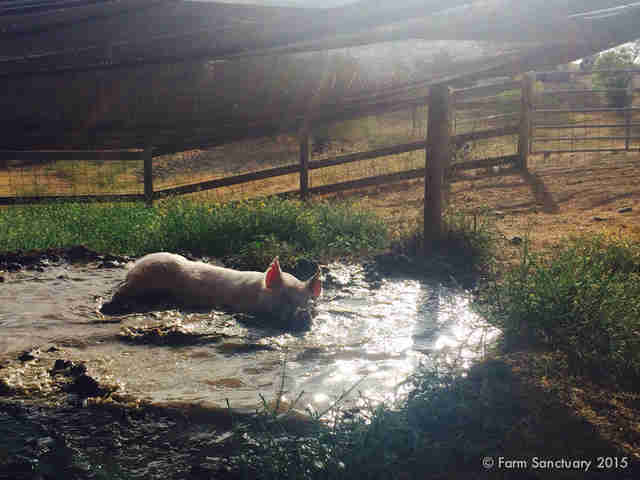 "She immediately took to having a large yard with dirt for her to root in and mud for her to wallow in," Pell explained. 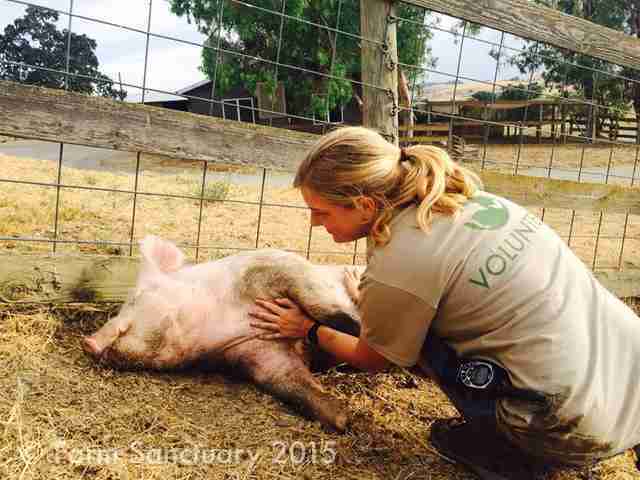 "She just found her pigginess very quickly and with great ease." Lola has also quickly endeared herself to her caretakers, just like she did with Bruno. 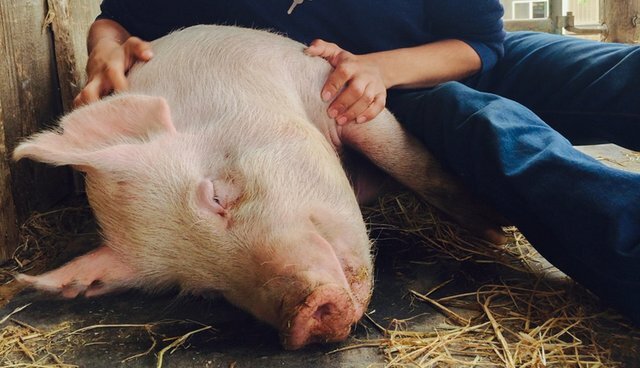 "She loves the caretakers, she loves belly rubs - she's incredibly sweet and friendly," Pell said. But of course, the move is bittersweet. Bruno couldn't help but be sad when he said goodbye to his best friend, but kept his chin up by remembering what a happy future she now had. 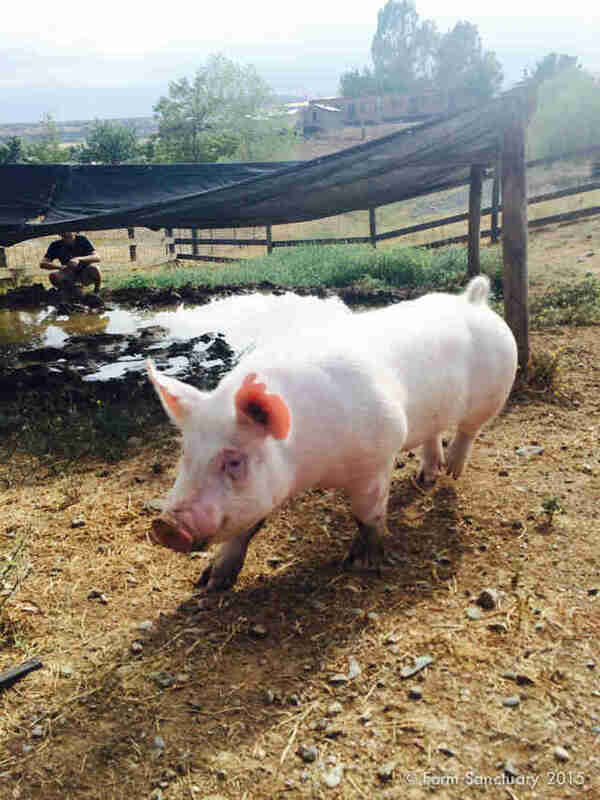 If you'd like to support Lola and other animals like her, you can make a donation to Farm Sanctuary here.